Citizens and civil society organisations representing rightsholders and stakeholders play an essential role in all societies. In order to ensure the participation of rightsholders and stakeholders and safeguard civic space in general, there must be basic rights for people to be able to associate, assemble and express themselves. Such basic rights are the foundations of a democratic society and are paramount in ensuring the vital communication between policy and decision-makers and public opinion. However, rightsholders and stakeholders are heavily threatened, and civic space is shrinking globally. The basic rights of freedom of association, assembly and expression are being undermined in a vast number of countries, which is impeding sustainable development. Environmental and indigenous human rights defenders are facing the worst consequences of this global trend. A recent study by the Institute for Development Studies emphasises that ‘shrinking civic space is highly likely to halt or reverse progress towards reducing inequality, ensuring inclusion and improving sustainable development’. The study reveals that those who are already subjected to discrimination or who currently work to tackle critical issues are especially under threat. Moreover, a United Nations (UN) report on environmental human rights defenders highlights the rising trend of violence and brutality that they experience, and shows how Indigenous Peoples are especially subjected to human rights violations. Another UN report on the Rights of Indigenous Peoples revealed that in 2017 alone, 312 human rights defenders were killed in 27 countries, 67% of whom were defending land and environmental and Indigenous Peoples’ rights. 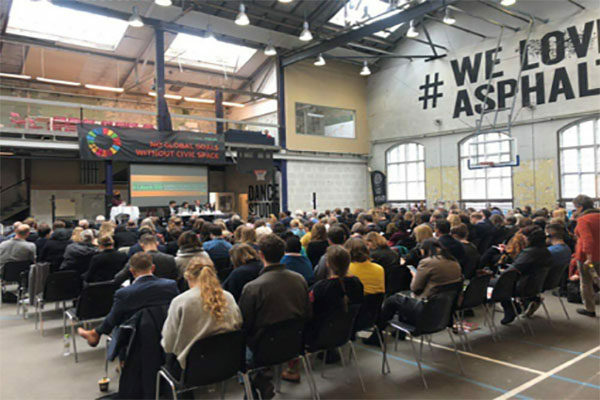 On 4 & 5 March 2019, an international conference ‘Claiming Civic Space Together – Joint strategies to ensure development and humanitarian action’ was held in Copenhagen. Governments, NGOs, rightsholder organisations and the private sector examined effective strategies and joint responses to the suppression of freedom of expression and civic space. They also examined their essential roles in the implementation of the 2030 Agenda for Sustainable Development, and how they could contribute to combating attacks on civic space and civil society. Keynote speakers from all over the world shared their knowledge and experience, and thematic workshops addressed the need to link Sustainable Development Goal (SDG) 16 to every other goal. In the Civic Space for Environmental and Indigenous Human Rights Defenders workshop, a Nicaraguan indigenous and environmental human rights defender described how she has been fighting for local communities and their environmental rights. She revealed having witnessed the disappearance of forests where livestock farmers and settlers illegally take up residence, with the rights of the Indigenous Peoples violated and their territories invaded. Edward Porokwa from Tanzania, a Masaai and director of a local Indigenous Peoples’ organization, described how Indigenous Peoples are being robbed of their lands, how their rights are being violated and how the space that civil society has for action is narrowing. Key outcomes of the session included the need for better protection of human rights defenders; to establish stronger partnerships at the local level; a call for more and better media trainings; and the need for the private sector to participate in pushing governments to protect Indigenous Peoples. The discussion on how online technologies are being used to restrict freedom of expression and restrict or manipulate independent media – and how we respond to this – examined the most effective joint responses to the suppression of freedom of expression and civic space both online and offline. According to Civicus Monitor, attacks on journalists was the second most common violation of civic space in 2018. Such attacks have significant consequences for independent media in particular. In order to achieve the SDGs, rightsholders and stakeholders must be informed and have the means to obtain information which can hold decision makers accountable. In light of this though, it was striking and concerning that there was no discussion on fake news. in terms of powerful right-wing actors using online media to push their political agenda, especially when considering the role of tech giants and the rise of populism globally. In the end, a variety of conclusions and joint action strategies came out of the conference, including: building collaboration literacy across sectors and themes; creating a more rapid response mechanism to help human rights defenders in need; ensuring funding for civic space; protecting digital media outlets so that they are more resilient against attacks; and establishing a comprehensive approach to civic space in development and humanitarian action in global multilateral institutions. As an illustration of this last point, the resolution by Member States of the UN Human Rights Council on the 21st of March this year was a timely reminder of the work that still needs to be done locally and internationally. The resolution recognised the legitimate role of environmental human defenders and Indigenous Peoples, in particular women, and the importance and urgency of ensuring their protection.